Written by Zoë Shacklock . It is fitting that my first encounter with Song of the Sea was a post on Reddit’s ’Background Art’ forum. The forum describes itself as ‘a place to share your favourite 2D background art’, seeking submissions from film, television, and video games. Devoid of the figures and action that usually seize our attention, backgrounds have an odd sense of emptiness, an air of anticipation - they seem to be waiting for something to happen. And something does happen when we look at backgrounds: the uncanny sense of emptiness dissolves as we begin to notice fine details, and the artwork suddenly comes to life. What at first seems like absence is simply an invitation to the audience, beckoning us towards the frame to animate its sense of place. Indeed, most of the backgrounds on the forum are formatted to be used as computer wallpapers, re-purposed as part of the habitual spaces of our everyday lives. So while ‘animated place’ may sound like something of a contradiction in terms, juxtaposing the stability of location with the movement of animation, it perfectly reflects the ways in which place animates our everyday lives, and is animated by us in turn. Song of the Sea has a particularly evocative sense of place, using its animated form to interrogate the entanglements between the lives of people and the life of a place. It engages with questions arising from this relationship - issues of belonging, emotion, and loss - and refracts these through its hand-drawn animation to comment on the way we connect with both narrative and nature. 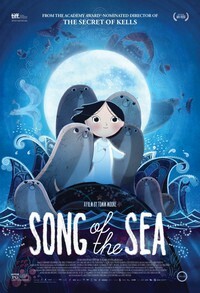 Song of the Sea is produced by the Irish animation studio Cartoon Salon, based in Kilkenny. Like the studio’s previous production, The Secret of Kells, the film draws from Irish mythology, and is clearly concerned with preserving and promoting narratives of place. In this sense, the film shares many of the same concerns and aims as what we commonly refer to as ‘national cinema’. National cinema seeks to sink its roots into the geological features of its geographical location, from US cinema’s enchantment with the sweeping plains of the west, to the obsession with the desert that runs through Australian cinema, or the harsh coasts and cliffs that abound in the cinema of Ireland. In the limited perception of humans, landscape seems neutral, autonomous, and temporally and spatially stable. The land is thus ripe for being sown with the seeds of nationalism, allowing the constructed notion of ‘nation’ to take on the connotations and qualities of the land. If the nation grows naturally from the ‘natural’ landscape, then it is always neutral, pre-given, and enduring. However, with the possible exception of Studio Ghibli, animated film is rarely included in the canons of national cinema. Of course, this has much to do with animation’s typical address to a young audience, but it also stems from the properties of the form itself. Representing landscape and place through animation rejects any sense of pre-existing stability; rather, it highlights the fact that place is always animated itself, always a work in progress, and always shaped by the hands of those who live within it. Animated film explicitly tells us that there are no landscapes that are not first the workings of culture, and there is no way to look at a landscape without culturally acquired and contextually specific modes of vision and evaluation. By transforming the roots of belonging and (national) identity into the routes of cultural creation, animation invites us to engage with landscape and place as process. Song of the Sea deliberately signposts the processes of place in a charming scene that capitalises on the properties of animation. During the journey to Dublin in his grandmother’s car, Ben makes a map of the route they are taking, noting down key features such as ‘creepy mountains’ and ‘broken car’. As the car travels through the countryside, the animation shifts seamlessly back and forth between Ben’s hand-drawn, crooked lines and the full-colour animation of the film. For Ben, there is no objective space of ‘Ireland’; rather, the landscape comes to life through the particular elements that capture his imagination. If place comes into existence through the way we move through it, then the imagination of place is always already animated. Yet the reverse of this equation is equally true - we come to life in the way we connect with place. Song of the Sea again uses its animated form to evoke this mutual creative agency, avoiding the normative assumption of the land as a blank slate fashioned and impacted by human actors. At the heart of the film is the legend of the selkie, mythical creatures who transform from human women to seals. Transformation and shape-shifting is a common trope of animation, for the fluidity of its form facilitates protean forms of movement. However, while this often tends towards the wondrous quality of unfettered movement - think of the ecstasy of flight in How to Train Your Dragon, or the joyous kineticism of The Lego Movie, to give two recent examples - Song of the Sea’s animated shape-shifting follows a slower pace and evokes a more sombre tone. The film uses recurring visual motifs to create strong connections between human, animal, and landscape, blurring the lines between them to hint towards a more abstract level of mutual transformation. Rather than a linear representation of transformation - the shifting of an individual form through time - the film’s transformations are always circular and communal, as the wonder of fluid movement becomes the thread that links all parts of the web of life. This is most obvious in the repeated motifs of circles, semi-circles, and spirals. Saoirse’s character design revolves around the motif: she spends most of the film holding her mother’s shell, a perfect spiral shape, and when she wears her magical selkie coat (which she needs to transform into a seal), her head is a perfect round circle. Ben, in contrast, wears a red cape for most of the film, and has a more triangular silhouette. This difference in shape reflects their different propensity for transformation. The children’s journey home is filled with circles and spirals, which recur in the shapes of rolling hills, animal dens, and human houses. Many of the scenes between human characters are framed by semi-circles, and Ben’s memories of his mother are depicted within a full circle border. This draws a clear connection to Celtic art, which also uses circles and spirals. However, the spiral form also evokes (perhaps unintentionally) the Fibonacci spiral, or the golden ratio, which recurs perfectly throughout both nature and human art. The visual motif thus presents nature and culture, landscape and human, as possessing a shared foundation. Here, the protean power of animation becomes a mode of relation between various parts of the world, as the motif transforms itself across natural and cultural worlds. Yet this holistic vision is not an innocent utopia, for the mesmerising beauty of the film is fraught with a sense of danger. While Saoirse’s connection to the sea is life-affirming, and her initial transformation is joyous, she spends most of the film slowly sickening as she struggles to make her way make to the sea. Saoirse’s physical demise speaks to anyone who has ever been homesick, one of the most universal and obvious ways in which place shapes our affective existence. The kaleidoscopic visuals suggest that our relationship to place is one of beautiful symmetry, yet the sombre tone warns us that such affective ties come at a price. The film’s villain, the witch Macha, steals the emotions of magical creatures, storing them in tightly sealed jars in her home. Removed of their emotions, the creatures turn to stone. Here, affective attachments to place have material effects on both bodies and landscape, leaving both vulnerable. This is furthered in the fact that the emotions are depicted as forms of weather, such as thunderstorms, rain, clouds, suns, and rainbows. To some extent, this reflects the way we often use weather metaphors to frame our emotional experiences: a sunny disposition or a thunderous mood. However, it arguably points to a deeper connection between emotion, place, and weather. Landscape’s agency tends to operate at scales (both temporal and spatial) beyond human perception - for example, the sliding of tectonic plates, or the erosion of a shoreline. The effects of weather, in contrast, can be easily discerned by human beings. The sudden transformation of a path into mud after rain, the desiccation of waterways and vegetation during a hot, dry summer, and the rhythmic change of the seasons are events that govern our affective experience of the world, and which we use to measure and structure our experience of time and space. In this sense, it perhaps makes a lot of sense that one of the most popular topics for ‘small talk’ is the weather: as a shared experience of the connection between people and place, it quickly establishes ties of belonging between acquaintances. The weather-emotions in Song of the Sea once again blur the lines between nature and culture, suggesting that the exterior features of the landscape are shaped by the interior dispositions of the people who inhabit it. Of course, any villain needs to be defeated, and Macha is vanquished when Ben smashes all of her jars and frees the emotion. However, the film then allows us to see Macha sympathetically, as she explains that she started collecting emotions to save her son (the giant Mac Lir) from his grief, believing that numbness was preferable to affective extremes. The importance of ‘freeing’ emotions suggests that, like both weather and place, emotions are things that are to be shared. At the beginning of the film, the characters are isolated from one another in their grief: Fergus seeks solace at the pub, Ben in his books of stories, and Saoirse in the magnetic call of the sea. The characters’ inability to communicate with one another is what leads to Saoirse and Ben’s exile to the city. In the end, the film’s true villain seems to be emotional repression and its resulting isolation. In this sense, Song of the Sea forms an interesting juxtaposition with the other key animated release of the summer - Pixar’s Inside Out. The two films share a similar narrative, in that both are concerned with a desperate journey home across a landscape that blurs interior and exterior life. Yet in contrast to the weather-emotions of Song of the Sea, Pixar’s vision of emotions are individualised, anthropomorphised, and solely interior elements, delegated to the ‘control panel’ of the minds of human beings. In Pixar’s world, the human mind is not unlike Macha’s glass jars, the proper container for the force of emotions. Both films have a clear emotional message: in Inside Out, emotions exist for a purpose, and in Song of the Sea, emotions exist to be felt. The emotionally laden power of Saoirse’s song works to free the emotions of all of those around her; Pixar’s emotional expressions, in contrast, work only in the service of individuals. Song of the Sea’s collective consciousness ensures that belonging is never presented as a simple relationship between an individual and the land on which they walk. As part of the film’s broader interest in the theme of holistic connection, belonging is also refracted as an issue of inter-personal relation. How do we belong to one another, the film asks, and how do these binding ties interweave with those we feel towards stories and scenery? When we first meet the 10 year-old Ben, he is sitting on a rock transcribing the stories his mother used to tell him into a journal, labelled ‘Mum’s stories’. Ben shares his stories and drawings with his dog, Cú, but banishes Saoirse to go and ‘play with some rocks’. Ben’s overzealous sense of ownership of the stories reflects the way they belong to both Ben and to his mother, and come to stand as a mark of their relationship, mediating the way in which they belong to one another. However, while Ben is possessively protecting his relationship with his mother, Saoirse acts out her own form of familial belonging, walking towards the water to where a group of seals bob in the water. Saoirse’s kinship with the seals and the water feels more immediate, as her openness towards the expanse of the sea contrasts sharply with Ben’s grief-stricken attempt to demarcate clear boundaries. Indeed, Ben’s relegation of Saoirse to the ground and the ‘rocks’ reflects the way she relates to the world (and her absent mother) through a more material connection with the land. The film thus seems to present two different (and gendered) forms of belonging - belonging as parochial, territorial forms of boundary marking, and belonging as a mode of embodied being in and with the world. This contrast reappears later in the film, during Ben and Saoirse’s attempt to find their way home. Saoirse plays her four-note refrain on her mother’s shell, bringing shining beacons of light to life which clearly direct a path across the hills. Ben, however, prefers to follow his hand-drawn map, leading them into an ominous looking forest. Again, the relationship to the land is split down a certain gendered form of belonging and wayfaring: one of multi-sensorial harmony versus a more mediated form of cartography. Such gender politics are highly visible in the final scenes of the film, in which the children’s mother Bronagh returns to the land (and to human form) to take Saoirse with her beyond the horizon. Ben and Fergus stand some distance apart from the women, and plead with Bronagh not to take Saoirse away. It would be easy to read this scene as a typical divorce narrative, in which parents argue for control over the children. However, the sense of loss that pervades the film, in conjunction with the geometric style of the animation, places grief and loss as simply part of the holistic web of life. Consequently, the film never blames Bronagh for her return to the ocean, but accepts that she belongs more to the sea than she does to Fergus and Ben. No one really belongs to us, the film seems to suggest - belonging is instead a way in which we can relate to one another, a mutual entanglement between bodies and beings. It is a mode of relation rather than a form of possession, and in this sense, it can be a powerful act of agency. Saoirse makes the decision to stay in human form in the end, telling her mother that she ‘want[s] to stay’. The film gives Saoirse the power to choose where she lays her roots, yet simultaneously accepts that Bronagh will simply never be at home on land. Again, it never fully resolves the gendered nature of this split: indeed, Saoirse’s decision marks the breaking of her silence, suggesting a shift from the pre-verbal feminine realm to the masculine world of the word. However, this works towards a larger point: even though there are multiple forms of belonging to place, not every form is open to every person. This recognises that ‘choice’ is position of power when it comes to attachment and belonging, and respectfully nods towards the specificity of indigenous ties to place, which cannot simply be ‘chosen’ or appropriated by anyone. The recognition of the constraints involved in our connections with places contributes to the serious and sorrowful tone. I found the film deeply moving, in part, I believe, because its elegiac tone works on numerous levels. As well as the diegetic story of maternal absence, the film is telling three other narratives of grief and loss. Firstly, it mourns the decline of hand-drawn animation. A lot of the critical attention surrounding the film focuses on the beauty of the animation, and tends to mention how rare it is to see a fully hand-drawn feature film today. Every frame of Song of the Sea is a delight, and every frame is a labour of love, reverberating with the time and effort needed to produce them. The affective relationship between people and place is deeply ingrained within the smallest units of the film: the creation of each frame requires a loving relationship between the hand of the animator and the world of the film, a relationship renewed every time pen touches paper. If each frame is a testament to a relationship that is harder and harder to find in contemporary animation, then it is no wonder that a sense of loss seems to emanate from within them. Secondly, the film makes a strong case for the conservation of Irish mythology and culture. Like The Secret of Kells, Song of the Sea seeks to preserve the traditional legends of the Celtic people, updating them for a contemporary audience. In this sense, the film also seems to mourn the destruction of indigenous narratives, and it takes pains to celebrate the power of storytelling. For while Saoirse’s embodied forms of connection to the land seem to exist at a level beyond language, Ben’s narrative knowledge also has an important role to play. At one point in the film, Saoirse and Ben encounter the deena shee, or faeries, who have forgotten the verses of their traditional song - verses which Ben is able to readily supply. Later, Ben meets an old faery who keeps stories in his long hair, with each strand of hair holding a particular narrative. This faery brings together Ben and Saoirse’s forms of belonging, suggesting that narrative can also be a form of embodied relation to the world, and, vice versus, that our embodied ways of being in the world also take the form of narrative. Just as we find roots within the landscape, narratives find their home within our bodies, able to shift the materiality of our form and inhabitation within the world. The relationship of love and care at work between the hand and the animated frame also seems to extend to cultural narratives; the sombre tone warns us that unless we preserve these narratives, in our books or in our bodies, they will disappear as surely as they do from the memories of the faeries. Finally, these preservationist narratives of loss come together to comment on our relationship to the land itself. I do not think it is too much of a stretch to suggest that the film has a deeply ecological address, and as such, can be positioned alongside contemporary climate fiction. Dublin is presented as dark and dreary, all harsh angles and triangles as opposed to the circles and spirals of the Irish countryside. Of course, this is mainly due to the fact that Dublin is a place of exile for the children, whereas the countryside is their home. Yet it also makes an implicit commentary on urban pollution. On their journey back home, Ben and Saoirse stop at one point beneath a series of electricity pylons. The pylons take the shape of Macha’s owl cronies, who are chasing the children across the landscape. By embedding the owls within the pylons, the film links the villains with industrial land use. The film thus also seems to mourn for the degradation of the land, suggesting that as surely as the children’s home can be whisked away from under their feet, our own places are slipping away. This all sounds like a rather gloomy cinema experience. However, the film’s celebration of the power of transformation holds out hope for all three of its elegies. In the magical and moving conclusion, Saoirse sings her selkie song to bring the magical creatures of the world, and in particular, their emotions and affects, back to life. The emotional peak of the film suggests that cultural narratives (and animated film) have a power to awaken the vitality of place, and function to remind us of our emotional entanglements with the world around us. On leaving the cinema, I found myself thinking about The Piano, another film particularly invested in questions of belonging, affect, and landscape. Campion’s film ends with Ada imagining herself beneath the waves, where ‘everything is so still and silent that it lulls me to sleep. It is a weird lullaby, and so it is; it is mine.’ Song of the Sea’s closing credits are accompanied by a lullaby by French singer-songwriter Nolwenn Leroy, which asks the audience to ‘come with me / Where the ocean meets the sky / And as the clouds roll by / We’ll sing the song of the sea.’ If Ada’s ‘weird lullaby’ and ocean grave belongs solely to herself, then the song of the sea, like animated place itself, invite all of us to join in. With Leroy’s lullaby running through my head, I returned home to immediately change the wallpaper of my laptop, ensuring that the green spaces and stories of Ireland continue to animate my emotional ties to the world around me. The entranced and loving responses to the Background Art subreddit suggest that in this act of attachment I am, just like Ben and Saoirse themselves, never alone. This Alternate Take was published on August 09, 2015.